It's been too long since I've posted here; I have been stitching but not posting about it. I did manage to finish stitching my 7th animal (the pig) from the Prairie Schooler Barnyard Christmas leaflet and I've started the final one. My oldest daughter will be graduating from college in a few short weeks. She asked me to stitch her a cat for her French professor. We both agreed that this one by Danybrod would be perfect. I stitched it up yesterday and she is going to sew it together and put some whiskers on it. 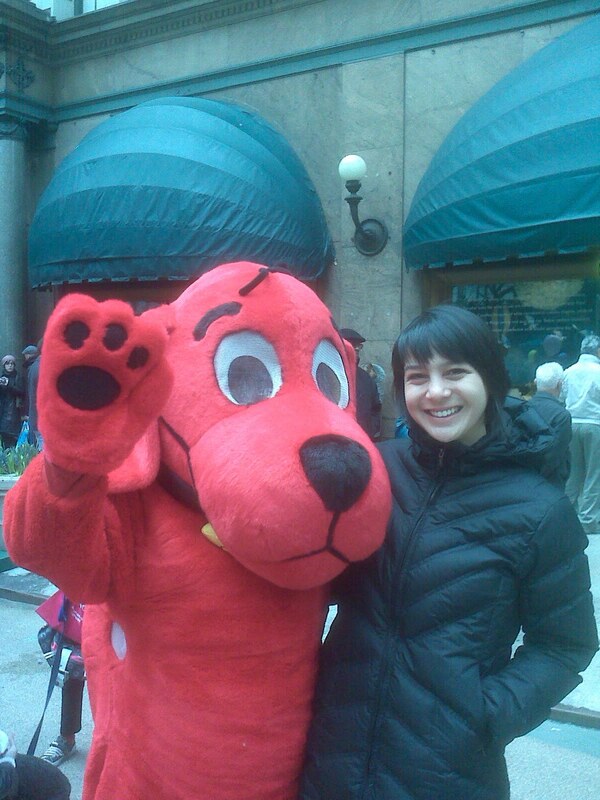 This spring break she went to New York City and had some fun adventures. She met Clifford the Big Red Dog and visited a store dedicated to trims. Can you imagine that, an entire store filled only with trims, most of them imported from France? She picked up several nice ones for me. I sent my most recent Christmas Ornament Exchange to Edgar which he received this week. I'm always so happy to stitch for Edgar because we both share a love for Prairie Schooler designs. I thought this one was perfect for him because he is a very hospitable person, and pineapples are a symbol of hospitality. Thanks so much for dropping by. I hope you are enjoying springtime. Hi Julianne ..nice to see your post..Love your pig and the cat..your stitching is always so neat..
You make me laugh...LOL! Edgar IS a very hospitable person and that is perfect for him! LOVE the pig, now what are you going to do with all your Christmassy animals? Friendly looking little pig and cute prim cat. A store full of trims sounds like a real joy! Welcome back Julianne. Your stitching is beautiful and I'm sure your daughter's professor will love the cat. Hello Julianne, The little cat is adorable and will make a very special present ! I love your two prairie schooler stitching pieces, very cute.. Cute pig - and I just LOVE the cat! Great to see you post, Julliane. The little cat is just so cute and PS finishes looks great. Lovely picture of your daughter and sounds like she bought you some lovely trims. Love your pig and cat and the Chat! That's a great gift! Every year I go to New York and have on my list to visit that Trim shop. I've heard that it's wonderful. Hopefully this year I'll make it there! Cute piggy, and a great cat for the prof but my favourtie has to be the little santa, he is such a darling and so cute. It's great to read a post from you. I love the pig and the cat. What wonderful trim your daughter picked up for you. Your stitching looks fabulous. Love the pic and the cat. I can't wait to see the cat put together.